GN new completed oil sludge treatment system will be preceded for water test soon. Now the complete system is ready and staying is GN assembly workshop. GN oil sludge treatment system can be used in recovering the oil from various kinds of waste oil sludge coming from oil base drilling cutting, oil storage tank remaining sludge, refinery waste etc. The ordered oil sludge treatment system is GN 2 cubic meters per hour model. Client is going to use this system as a demo to verify it is workable in recovering the oil from oil sludge. Actually, the excellent performance of GN oil sludge treatment system has been proved onsite. In this system, client plan to bring their SMO (shear, mixing and oxidation) unit to connect with GN oil sludge system for better demulsification performance. GN Oil Sludge Treatment System is consisting of below modules. 1. Premixing Tank Module – the oil sludge is firstly transferred to the premixing tank by the vacuum pump. Here in the tank, water and chemicals will be added into the tank, with heating line around the tank, the sludge will be washed, much flowable. 2. Classify System – the washed sludge will then be pumped into a V-shape bottom tank for solids sedimentation and liquid classification. The top layer oil will be flow into 3-phase disc centrifuge for water, oil and solids separation. And bottom solids will be mixed; here the chemicals can also be added. 3. 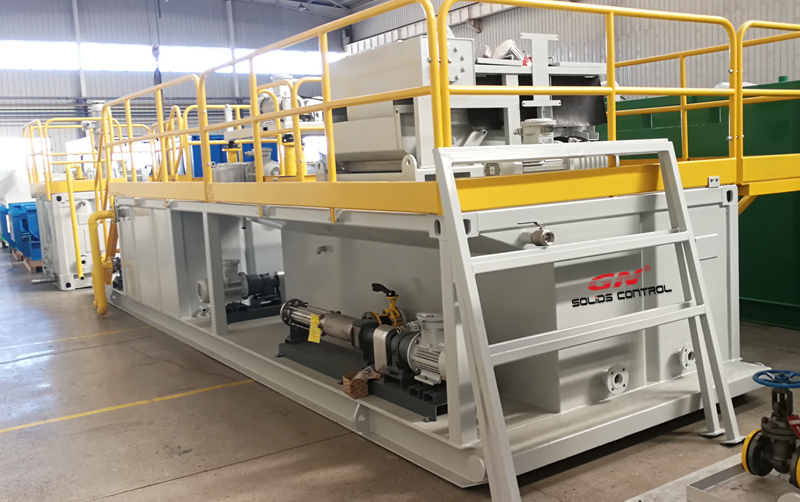 Solids Control module – in GN oil sludge treatment system, the solids control module is consisting of coarse shale shaker and decanter centrifuge to remove as much as possible solids from the sludge. 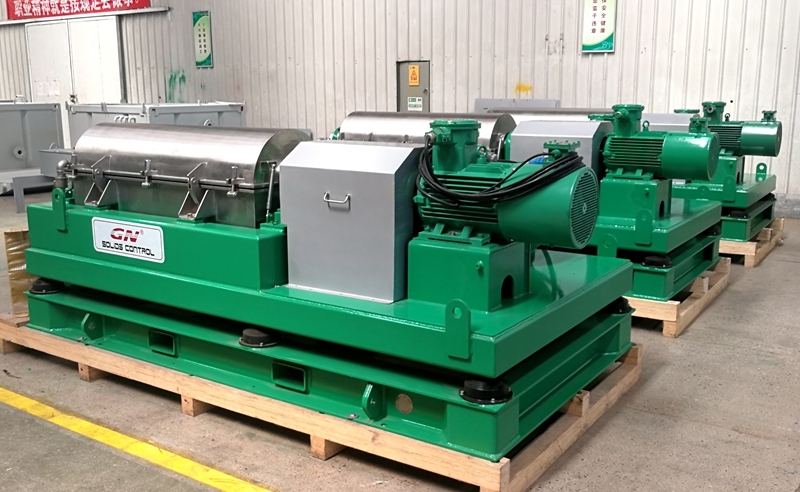 To get as less as possible oil content on solids, the solids discharged from the decanter centrifuge can be washed again and then treated by the second unit decanter centrifuge. Liquid discharged from decanter will pumped to the second unit disc centrifuge for water and oil separation. 4. 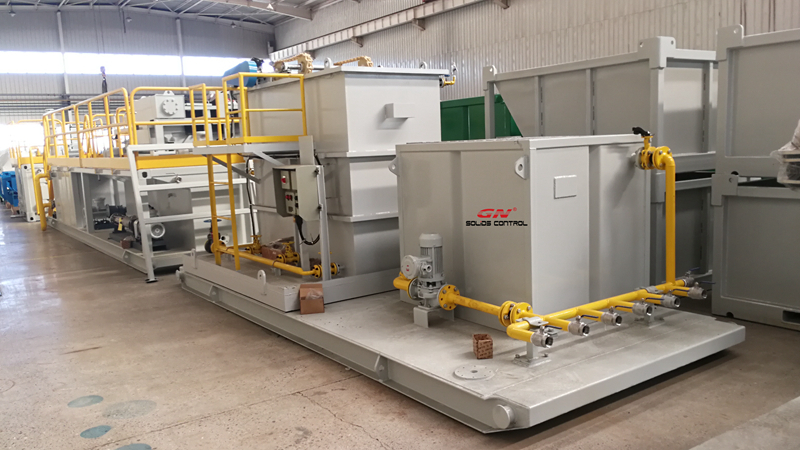 For back up, GN made the 3-phase separation skid module with inclined plate clarifier and oil water separator. To maximally reduce the oil content in water, GN made the micro bubble oil water separator in the system to make the water as clean as possible. 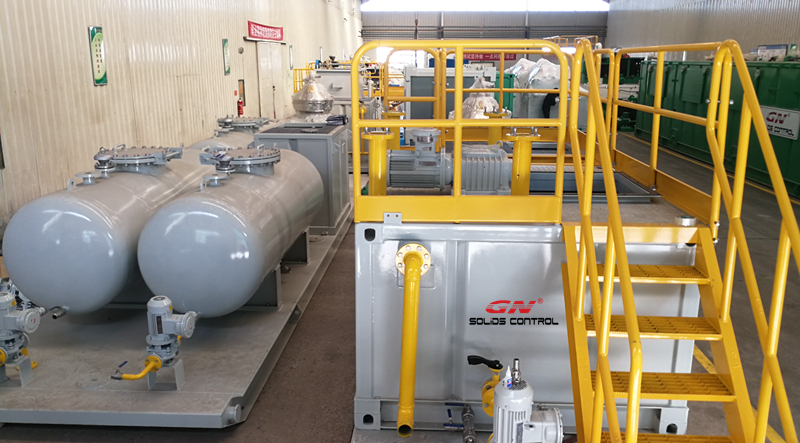 GN has another oil sludge treatment system with capacity of 15 cubic meters per hours is almost done, now is the final assembly procedure. For more information on GN oil sludge treatment system, please feel free to contact us. TEFTEC is one of the largest annual water quality technical conference and exhibition, providing the extensive educational opportunities and unparalleled access to the field’s most cutting-edge technologies and services. 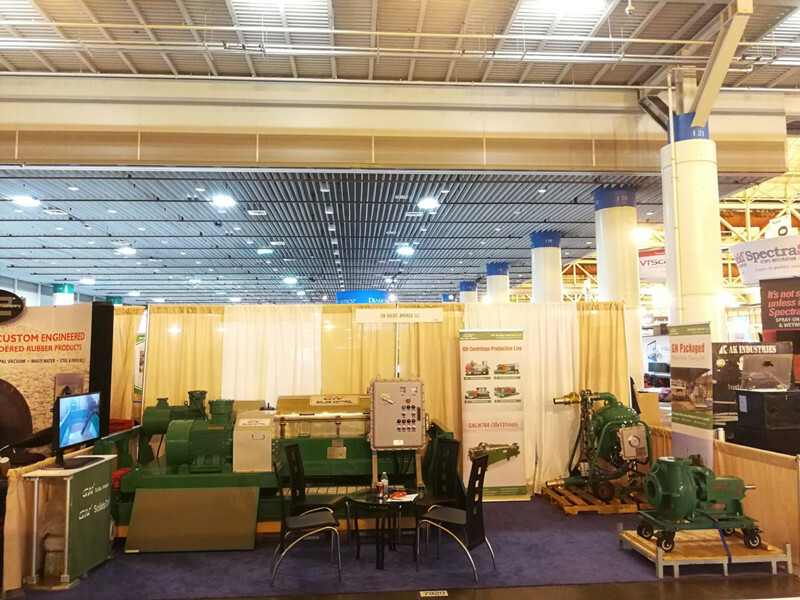 GN Solids Control has shown at this exhibition last year, this year, GN comes again. Welcome to GN booth to have a look at GN products, below what GN will show at the exhibition. 1. Waste water decanter centrifuge – with many years development, GN decanter centrifuge is widely used in waste water treatment and some other industries. GN waste water decanter centrifuge is specially designed for waste water clarification and waste slurry dewatering. GN centrifuge sizing from 9 inch mini model to 30 inch big bowl. 2. 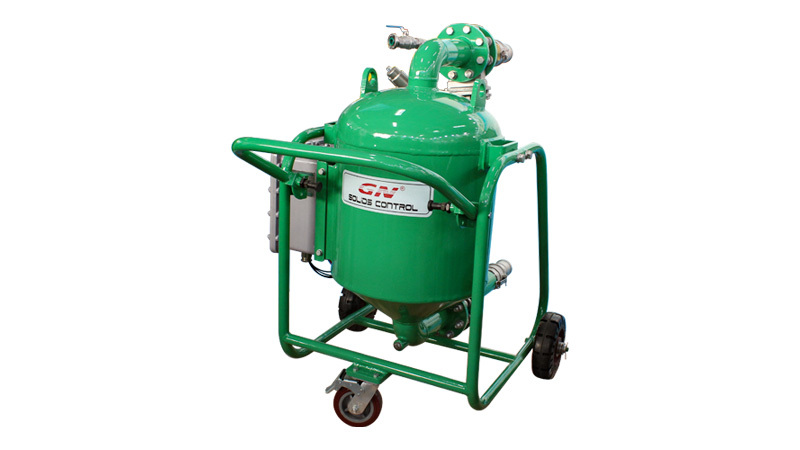 Vacuum slurry pump – GN vacuum pump is used for high solids content slurry transferring. This pump can be used in waste cutting transferring, dredging slurry transferring and even dry solid. 3. Centrifugal Pump – GN centrifugal pump is made of wear-resistance iron. It is widely used in drilling site for mud transferring, water transferring. 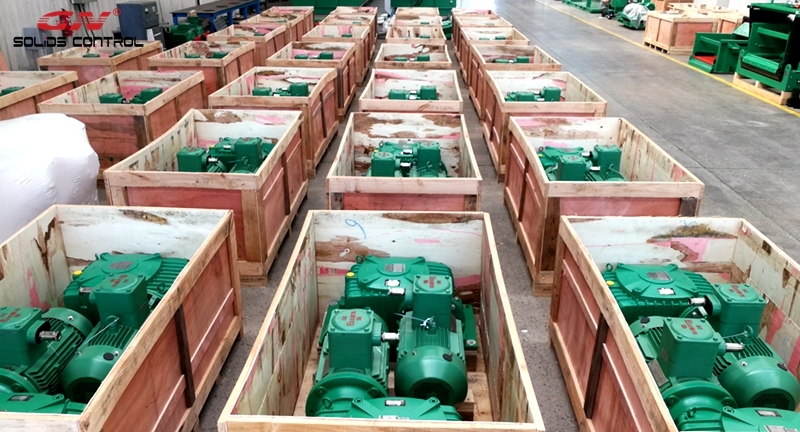 All the wear parts of GN centrifugal pump are interchangeable with world famous brand. 4. Shaker Screen – composite frame screen with longer lifetime and convenient for store without rust risk. GN is looking forward to seeing you at the WEFTEC 2018. Fur USA local support, welcome visit our office GN Solids America in Houston, TX. Decanter centrifuge is one of GN main product that is used in many industries. 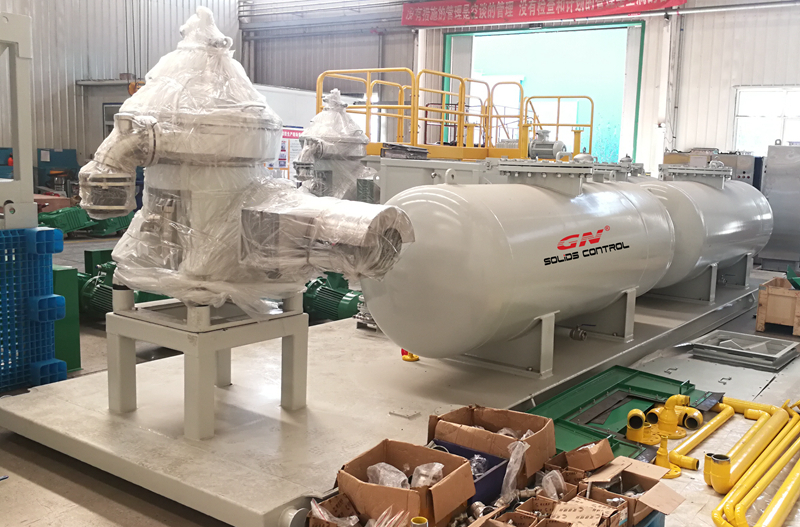 This month, there are some decanter centrifuges in GN factory will be assembled completely and then shipped to Russia for a waste water treatment project there. The ordered is GN 14 inch drum diameter unit with model GNLW363C-VFD. 1. Top class material used for rotation part – GN 14 inch decanter centrifuge drum is using duplex stainless steel 2304 that is much better than SS316L. The centrifugal casting technology ensures the material distribution evenly so as to guarantee the excellent dynamic balance. 2. Protective design of wearing part- at all the decanter centrifuge wearing part like the screw propeller, inlet slurry distribution port and solids discharge port, GN protects all these parts with tungsten carbide alloy material to ensure a long working time. Inside the collection box and around the solids discharge port, GN installed scrapers to prevent the solids building up so as to protect the drum. 3. Humanized electric control panel – GN is able to equip the 14 inch decanter centrifuge with VFD control panel to run the drum with speed of 0-32mm rpm and the feeding pump with different flow rate. Operator only need to input the desired speed on the HMI touch screen, the worked by PLC, the centrifuge will run per the instruction. With many years research and development, GN decanter centrifuge is able to be used in many industries like mud recycling, dewatering and waste water treatment. 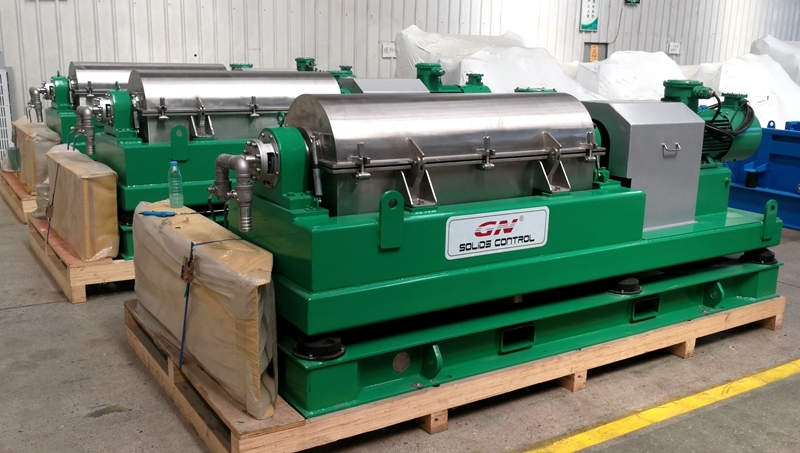 Last month, GN shipped out 2 big bowl decanter centrifuges to Australia for coal slurry dewatering. The units sent are with 30 inch bowl diameter which is the largest model GN can make at this time. GN has 9 inch, 14 inch, 18 inch, 22 inch and 30 inch decanter centrifuge, by changing the centrifuge drum length and cone angle, these models could be applied in different industries. For more information, welcome contact GN. GN complete solids control system is provided with mud agitator, according to the tank depth, GN engineers know how long to design the agitator shaft and single impeller or double impeller needed. To prevent the disturbance of the stirring shaft when agitator is working, GN designs the stabilizer at tank bottom to fix the shaft. When providing the single mud agitator unit to client, GN always will ask client to provide the inner dimension of the tank and the mud density, so that to propose the mud agitator with right shaft and power. GN is also to provide the mud agitator with motor starter. GN vacuum pump is especially used for high solid content sludge transferring like drilling cutting from mud system to waste management system. It is fully pneumatic driven type pump that can be used in hazardous area with flammable gas. The vacuum pump is easy for maintenance as there is no any movable part inside the pump cavity. 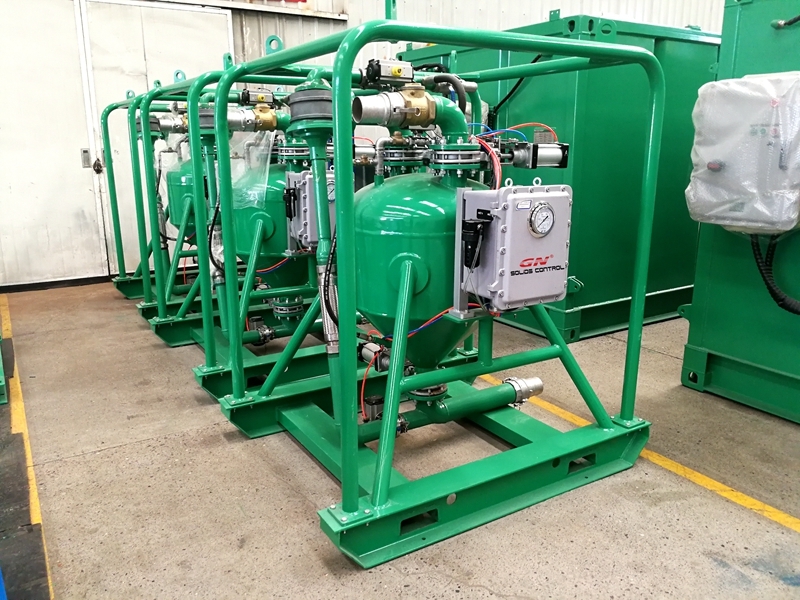 GN has vacuum pump with flow rate of 40, 20 and 10 cubic meter per hour for client to select. For easy and continuous operation, GN vacuum pump can work under automatically mode. For more information on GN solids control equipment, please feel free to contact. Recently, GN finished the fabrication of one set oil based drilling cuttings treatment system for CNPC project. 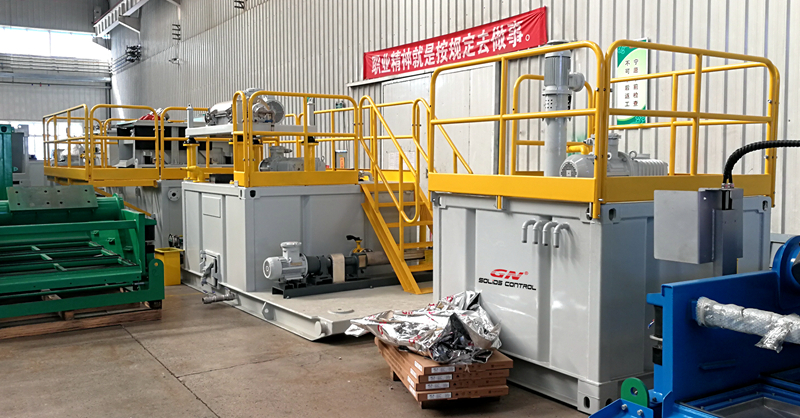 Before, CNPC has ever purchased several units drilling cuttings treatment system from GN Solids Control. 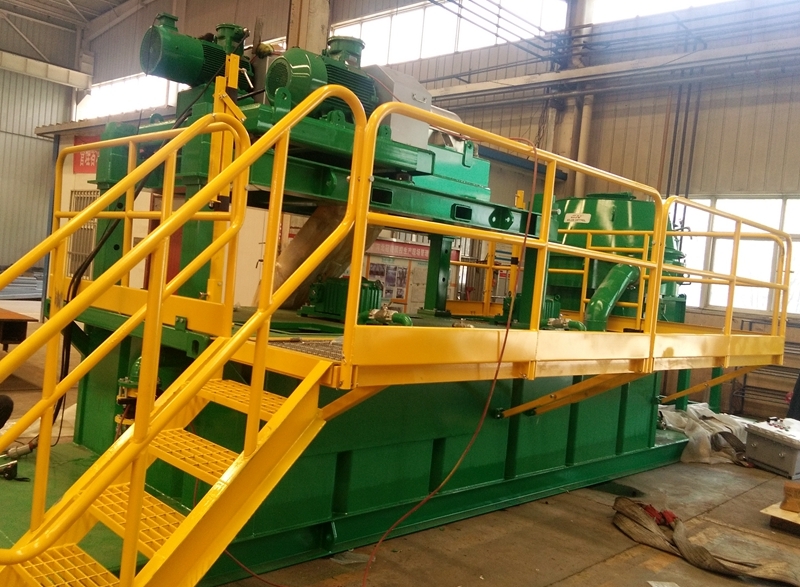 The drilling cuttings treatment system is used to treat the drilling cuttings discharged from primary solids control equipment like shale shaker, mud cleaner and barite recovery decanter centrifuge. For environment protection and cost saving consideration, the drilling operators is using the cuttings treatment system to recover more drilling fluids from cuttings, in the meanwhile, less waste will be discharged into the nature. To increase the working efficiency, GN released the vacuum pump unit that performs well to transfer cuttings sludge to treatment system. 1.Cuttings Dryer unit – this is the main equipment used to remove the large size cuttings and recover oil base drilling fluids. After treated by this unit, the OOC will be going down to less 5%. It is the most important equipment in this cuttings treatment system. 2. High Speed Decanter Centrifuge – the decanter centrifuge is used to polish the effluence liquid coming from the dryer unit by remove the fine solid particles. 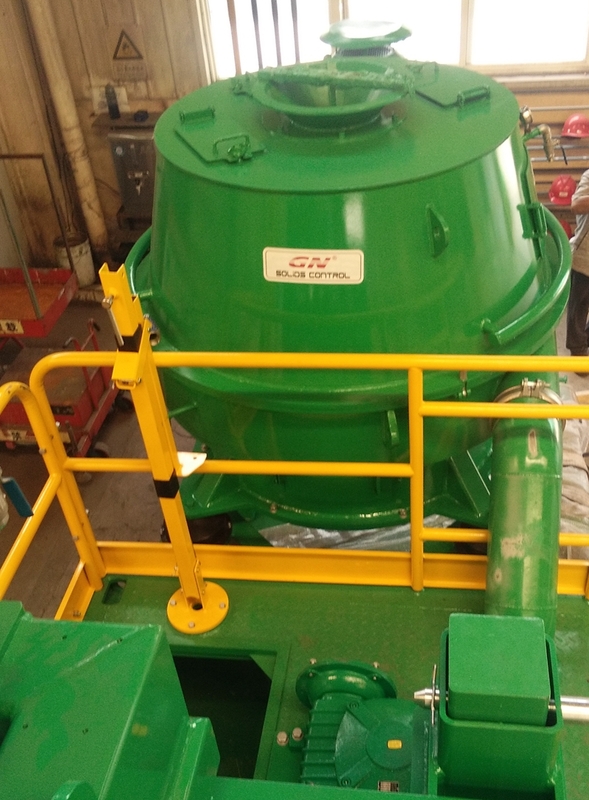 With a speed up to 3200rpm, the centrifuge will remove the solids bigger than 5 microns to make the drilling fluids more acceptable for reusing. 3. The skid of the system is designed to with a buffer tank that is divided into 2 compartments. First compartment is used for collecting the drilling fluid from the dryer unit, and the second compartment is to store the polished drilling fluids after treated by centrifuge. GN is using the Netzsch screw pump to transfer the fluids from first tank compartment to the centrifuge unit. GN has rich experience in designing and manufacturing the drilling cutting treatment system and solids control system. Besides this skid mounted system, GN is also able to provide the modularized cutting treatment equipment.